Durians are the King of Fruits. Imagine the best, most delicious, and sensuous banana pudding you can imagine, add just a touch of butterscotch, vanilla, peach, pineapple, strawberry, and almond flavors, and a surprising twist of — garlic??!! Like many of life’s greatest experiences, eating durian cannot be adequately described with words. 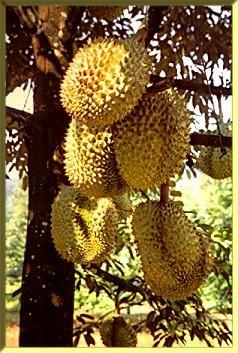 Durian has a characteristic delicious flavor, creamy texture, and tantalizing fragrance that is just... durian! — the king of fruits, Nature’s most magnificent fruit gift. Durians vary greatly in quality, but the really good ones...I can’t imagine a more delicious, sensuous, and exquisite food in existence on this planet. The durian has a primeval quality — this very nutritious and delectable fruit occurs to me as perhaps the original optimum primary food of Nature intended for human beings’ provision in the prehistoric jungle wild. The durian tree is a strong, powerful, majestic tree that appears to have no inbuilt genetic program to die; if older trees die after centuries, it is the result of damage by wind, lightning, flood, humans, or soil deterioration followed by weakness and disease—not the result of sheer old age. Eating the extremely delicious, delightful, and nutritious fruits showered by this benevolent tree is an incredible influence for the health, strength, and longevity of your body. It's a true Tree of Abundant Life. Eating a good durian is such a satisfying experience, blissful. As Mark Twain declared the cherimoya "deliciousness itself," I say the durian is "blissfulness itself!" I think it perhaps not coincidental that so many of the buddha statues in Southeast Asia have been created with the head covered with points that very much resemble a durian. 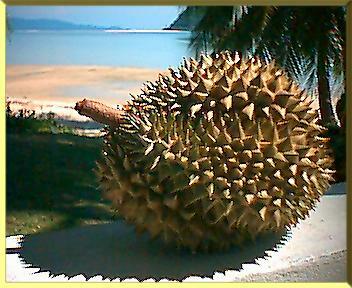 (And I say that knowing full well that in some countries the creation of those statues pre-dated the durian’s arrival.) Eating a good durian can be a spiritual experience, giving quite literally an exquisite taste of bliss. It’s one of the remarkable traits of this remarkable fruit that so many people, especially in Eastern cultures, totally, wildly, enthusiastically enjoy everything about durians, including their fragrance, while many others, mostly from Western cultures, are repulsed by the same fragrance and say that it "stinks." Particularly in Southeast Asia, durians are loved by millions of people with a passion and near-reverence quite unusual for mere food. Meanwhile in the West, durians have gained a notorious reputation for their unfamiliar and strong aroma, largely as a result of Western travel writers and horticultural writers delighting in using snide phrases like "unbearable stench," "rotten onions with limburger cheese and low-tide seaweed," "French custard passed through a sewer pipe," or "like sitting on the toilet eating your favorite ice cream." Fresh durians do announce their presence with their fragrance, gently until ripe and robustly thereafter, but I would never say they "smell bad." Those writers must have unfortunately encountered a low-quality or seriously overripe durian...or interpreted the fragrance as resembling an unpleasant odor in their past...or let the fragrance accumulate and spoil indoors. We all take it for granted that a fruit’s odor tracks with the fruit’s current actual condition of freshness or spoilage. For example, a rotten banana smell can only have come from an actually rotten banana in the vicinity. Durian is different in a very unusual way: its fragrance spoils quite independently and tremendously more rapidly than the fruit flesh itself. The original fresh fragrance from a good durian at optimum ripeness is fruity and appealing, and I can barely imagine that anyone would not enjoy it. But a ripe durian held in a closed indoors space continues to emit its distinctive fragrance substances, which within half an hour can spoil and change into a decidedly foul rotten-eggs odor that matches many of the negative reports about durian fragrance. Meanwhile, back at the fruit flesh, everything smells fine, fresh, and fruity; it’s on its own track, and may not actually spoil for several more days. It is this characteristic super-fast deterioration of durian fragrance in a closed space that has led to the banning of durians in many public places in Southeast Asia, such as hotels, buses, and airplanes. These kinds of negative reports about durians often occur to me as having progressed to a kind of fruit slander. Spoiled durian odor is not the normal enjoyable fragrance of durian any more than rotten banana odor is the normal enjoyable fragrance of banana. Curiously, even unspoiled durian fragrance apparently reminds some people of things that smell bad, but it’s not that it actually does smell bad. Rotten eggs, rotten onions, skunks, cannonball tree fruits, raw sewage — those are things that actually, absolutely do smell bad. But not durians! Not the same category, not even close. Fresh durian fragrance occurs to me as a kind of pleasant, strong, sweet, fruity, sawdusty aroma... again, words are inadequate. In any case, durians and their perishable strong jungle fragrance do not usually fit well in the indoor environments of modern human civilization any better than, say, elephants. And like elephants, they’re really best enjoyed outdoors anyway!